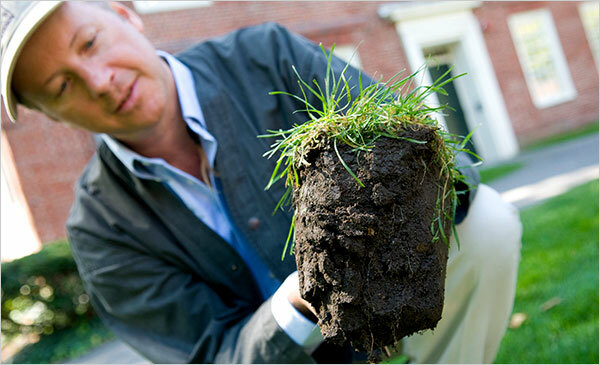 Eric T. Fleisher holding a core sample from the organic lawn at Harvard University. A student in Harvard Yard, a heavily traveled part of campus where the soil restoration project began in 2008. Mr. Fleisher at the university facility where compost tea is brewed. Kieran Clyne, a Harvard horticulturist, sprays compost tea on the gardens of Treadwell-Sparks House, the residence of the Rev. Peter J. Gomes. 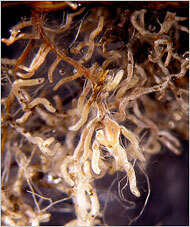 A microscopic image of roots from an oak tree on Harvard Yard. Earth Week is a good time to celebrate earth itself — the planet’s loose covering of fine-ground ancient rock we call soil. In its healthiest state, soil teems invisibly with a busy living web of water, gases, insects, bacteria, and fungi. In the right balance, these interacting biological and chemical components enrich soils, which in turn support healthy plants. Soils under human care require maintenance that is “adaptive,” he said — meaning flexible, comprehensive, sensitive, and complex. Last year, his holistic view (and expert direction) inspired an eight-month soils restoration project in Harvard Yard. “It’s not product-based,” said Fleisher about the approach. “It’s knowledge-based.” Just adding chemicals denies the biological, chemical, and structural complexity of soils, he said. Better to study them, care for them — and rest ore them — from the bottom up. In a world of plant care still seduced by the power of single chemicals, landscapers have to embrace the idea that there is “no one single answer,” said Fleisher, and that healthy plants begin with healthy soils. The Harvard project was modeled on Fleisher’s work as director of horticulture at Battery Park City Parks Conservancy in Lower Manhattan. Since 1989, the 37-acre swath along the Hudson River has been New York City’s only fully organic public landscape. The Harvard soils project of 2008 bloomed into an organic landscaping operation that since last May covers the 16 acres of Harvard Yard and adjoining Tercentenary Theatre. This spring, more of the University’s landscape footprint was added to the organic column, including the GSD, Harvard Kennedy School, and the Harvard Graduate School of Education. Behind the greening of the greenery is Harvard’s Facilities Maintenance Operation (FMO), a division of University Operations Services that employs 29 landscapers. FMO maintains most of Harvard’s lawn, shrub, and tree assets. The soils restoration project, guided by Fleisher, also drew on Michael Van Valkenburgh, Charles Eliot Professor in Practice of Landscape Architecture at GSD; the physical resources and planning office at the Faculty of Arts and Sciences; and New York arborist James Sotillo of Tree Wise Inc.
Organic methods will be used exclusively on FMO-maintained properties within the next two years, said FMO landscape services manager Wayne Carbone. Initial soil testing — for biology, texture, and nutrient content — revealed that, in landscape terms, the patient was sick. FMO landscapers, with training from Fleisher, amended the soils with custom-made compost “teas.” The rich, dark liquids were brewed in 250-gallon vats fitted with aeration pumps, then sprayed onto needy soils. Over the next two weeks, the test plots were treated with one-time organic growth enhancers, aerated, seeded, and layered with compost. By May, the test soils were demonstrably healthier by both field and laboratory measures. By September, stunted root systems had stretched out up to 5 inches, the biomass of microorganisms had increased, and nitrogen levels were within a healthy range. “The results are there,” said Carbone, a 28-year landscaping veteran. Roots grew fast, but grass grew slowly. Once cut twice a week, it was now cut only once a week. Deeper roots in healthier soil retain moisture better; irrigation rates dropped to half that of Harvard’s conventionally landscaped plots. At that rate, less watering in Harvard Yard could save more than 2 million gallons of water a year. Yard soils were once so compact that aerating them was like punching holes in a parking lot, said Carbone. After restoration, it was like poking into butter. Meanwhile, last year’s test plots turned into living classrooms and soil labs. 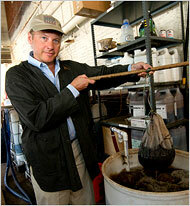 Fleisher and Carbone trained Harvard landscapers about tea brewing, composting, and sophisticated soil diagnostics. In October, Arnold Arboretum senior research scientist Peter Del Tredici visited the test plots with a class. Anne Pringle, an assistant professor of organismic and evolutionary biology at Harvard, used soils data in a bioinformatics lab exercise. And Harvard doctoral biology student Benjamin E. Wolfe employed DNA sequencing to study fungal and bacterial diversity in the Harvard soils. Another spin-off of the soils project is Harvard’s first large-scale composting operation, now in place at the Harvard Arboretum — a money-saver. Last year alone, trucking landscape waste off-site cost the University $35,000. The pilot program — including consultants, soil analysis, and contract labor — cost about $40,000. One-time costs for the composting operation, tea brewers, and other soils-restoration gear added another $45,000. Lessons learned on a large scale at Harvard can be applied on a small scale at home, the experts say. To help, FMO is developing plans for an affordable backyard brewing kit for organic compost tea.